We adhere to fair employment practices, uphold human rights principles, and empower our workforce with opportunities for learning and development. Our commitment to fair employment practices is supported by our Employee Code of Conduct, which sets the tone in relation to the Group’s stance against discrimination on any basis. We embrace workforce diversity and respect the values and cultures of the communities in which we operate. We adopt fair employment practices and comply with labour laws across our operations worldwide. In Singapore, Keppel adheres to the practices spelt out by The Tripartite Alliance for Fair and Progressive Employment Practices and endorses its Employers’ Pledge of Fair Employment Practices. 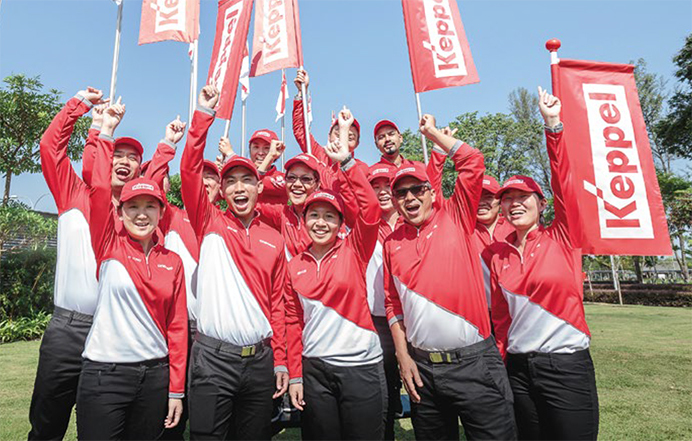 Keppel respects and upholds the fundamental principles set out in the United Nations Universal Declaration of Human Rights and the International Labour Organisation Declaration on Fundamental Principles and Rights at Work. Our approach to human rights is articulated in our Corporate Statement on Human Rights, and is guided by general concepts from the United Nations Guiding Principles on Business and Human Rights. We have zero tolerance for unethical labour practices such as child labour, forced labour, slavery and human trafficking in any of our operations. Keppel also supports the elimination of exploitative labour. Our suppliers are expected to comply with the Group’s Supplier Code of Conduct, which holds them accountable to responsible labour practices in their operations. Our people are our most valuable resource. We aim to be an employer of choice, and adopt a holistic approach towards attracting and nurturing talent. We hope to help every employee maximise their potential. Keppel offers structured learning programmes to enhance the skills and capabilities of our workforce. Our training centres equip workers with technical and core skills qualifications and support the upgrading and certification of skillsets. We also offer internships to tertiary students to expose them to the different businesses across the Group. Established in 2015, the Keppel Leadership Institute, headquartered in Singapore, offers a diverse range of leadership and professional development programmes, delivered in modular and blended approaches. The Institute grooms global Keppel leaders, equipping them with the capability and confidence to drive our businesses into the future. We engage our employees through feedback channels and activities that forge stronger relationships. Apart from the annual Global Keppelites Forum, a Group‑wide townhall, we continue to build camaraderie among employees through various platforms, such as the yearly Keppel Games, a series of sports competitions initiated by Keppelite Recreation Club, and volunteer activities organised by Keppel Volunteers. The Keppel Global Employee Engagement Survey in 2016 achieved a strong response rate and a high employee engagement score. Employees at Keppel regularly participate in Group‑wide activities and forge stronger bonds in the process.